The sad state of my nails in recent months made me avoid nail polish for the most part. I bought exactly one bottle (Guerlain Rouge d'Enfer, which was part of their holiday KissKiss trio). And couldn't bring myself to do much with the beautiful Zoya colors that kept taunting me from afar. To add insult to (self-inflicted) injury, I got lazy for a few days about cuticle oils and balms, and the result was Not Pretty. I paid for it and then some. I've been working on things, though, keeping my nails at a safe length and providing them extra nourishment, so things are slowly getting better. Enough so that I can start enjoying nail polish again. It was time to look at all the great colors and finishes and choose some favorites. It goes without saying that Zoya Naturel 2 collection was my first go-to. I loved the first Naturel lineup (they've been among my favorite and most used colors since they first came out), and I could have easily included the entire Naturel 2 in this post. But I made myself pick two: Marnie (warm plum) and Aubrey (mauve rose). You can definitely see why the collection was Zoya's transition into fall, but these are classic, ladylike colors that will serve me all year round. This brings us to the latest Zoya collection, another transitional Naturel (Spring 2015), but this time in the satin matte texture. You have to like the way the polish feels on your fingernails, but if you do, Rowan ( a sueded taupe) is a stunner. It takes quite a while to completely dry and achieve the matte look, but when it does, this is a very strong formula. Prim was part of Winter 2014 collection. It's somewhere between lavender blue and periwinkle, or stormy blue skies. A very unusual color that I find irresistible despite a streaky first coat application. From the same collection comes Imogen, a PixieDust glitter texture (my husband finds them amusing, though not necessarily wear-in-public material. It's the "go big or go home" color of this collection with large chunks of glitter that look confetti-like in a sheer black base. 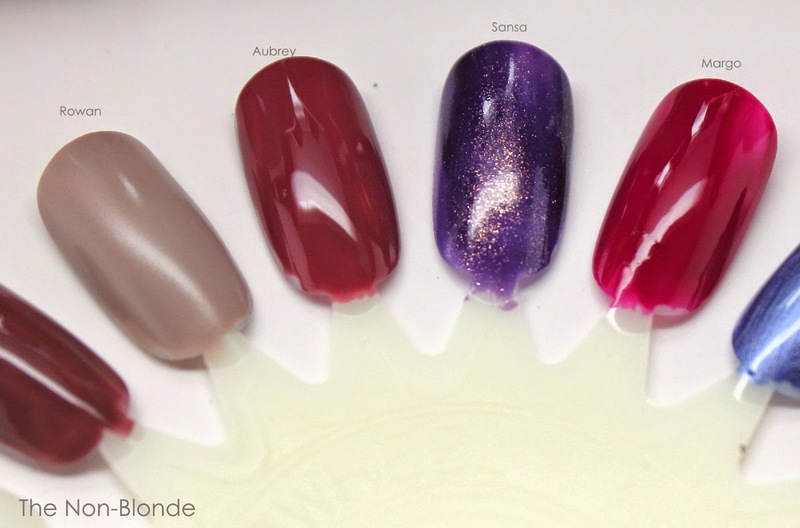 Margo and Sansa come from the Entice & Ignite collections for Fall 2014. 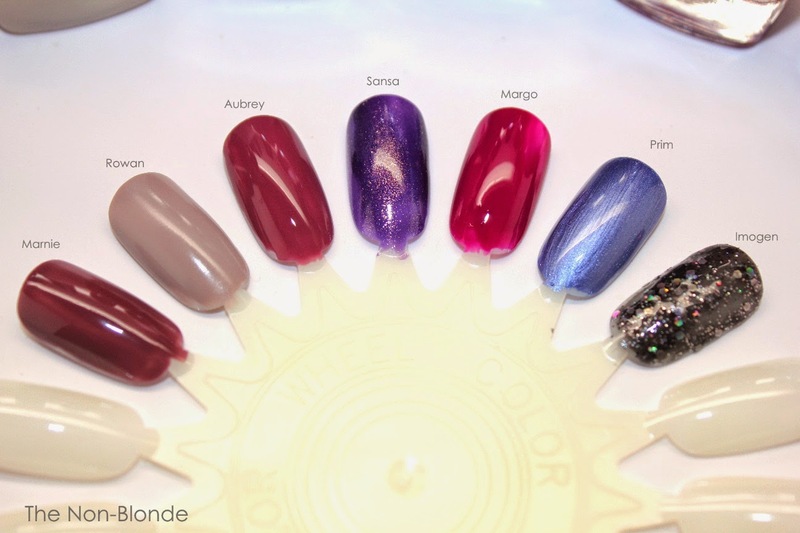 Zoya calls Margo a "modern red plum". I call it an almost fuchsia. It has an 80s throwback vibe and looks worthy of Alexis Carrington. I love Zoya's cream finish and its durability. Sansa, an obvious nod to the Game of Thrones character (April can't come soon enough) is a metallic purple with gold dust sparkle that makes it incredibly complex and alluring. This formula wears like iron and applies perfectly. I can get away with a single coat, but two are perfection. Bottom Line: I vow to take better care of my hands and nails and keep them worthy of these colors. All the nail polish colors featured here can be found on zoya.com ($9-$10). The products for this review were press samples. How to Get a 10% Off At Osswald NYC?